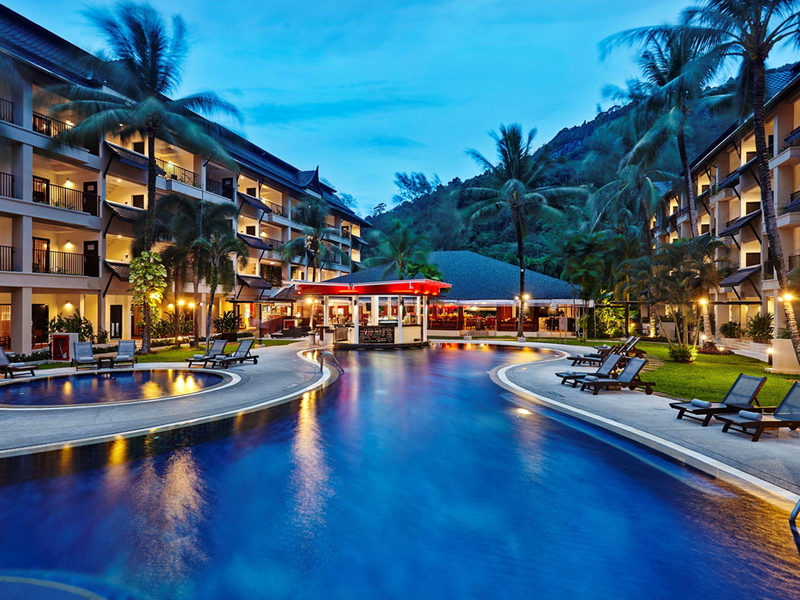 Delight in fabulous food from around the world at Swissotel Resort Phuket's three restaurants and bars with a wide range of local and international dishes and drinks a sumptuous breakfast buffet offers a wide range of choices to energise your day. A lagoon swimming pool and a spa & fitness centre make sure you'll have the best environment in which to relax and revitalise. With separate living rooms, private balconies and views of the lagoon-style pool and gardens, Swissôtel Resort Phuket's 180 stylishly modern suites are perfect for holidays with friends and families or for romantic honeymoons. Suitable for holidays with friends and families or for romantic honeymoons, Swissôtel Resort Phuket offers 180 one- to three-bedroom suites in five categories, each with its separate living room and private balcony. Rivage is a Mediterranean concept with a wide range of healthy and tasty dishes from Italy France and Spain accompanied by select wines. A wood oven/rotisserie/ char grill makes a spectacular cooking centerpiece. Joe Kool's serves a wide array of drinks and snacks, including refreshing cocktails and juices for your enjoyment while you relax by the pool. Staff were a standout, extremely friendly and attentive. A wonderful week family break for Parents and Kids! We stayed a week for a relaxing and family time oriented break in Kamala Swissotel establishment. We made the choice of a Family 2 bedroom with the kids decors and all day dine in included for them. The kids found new buddies and enjoyed the Hotel's facilities, Kids world and the rich activities programs during the day. I did this with flightcentre which got us free breakfast every day, a free cocktail every day, and one free dinner and lunch. My kids are 2 and 4. A holiday is about them being entertained, and they loved the pool and water slide in the center of the hotel, and happily swam in it (with floaties) most of every day with minimal supervision. We took the bigger family room, which had a main bedroom and a separate lounge bedroom with bunk beds for the kids, and enough room for them to play with kids table and chairs. There was a play room that the kids also enjoyed. Access to the pool is easy, no child gate and hotel rooms exit to the pool. We were on the first floor, and the stairs required me to hold my kids hand on the way to the pool, as they were stone, so any falls would have been a problem. The Thai food was excellent, and the breakfast was so good, I had to restrain myself from eating too much. Don't order Pizza or pasta, as Thai can't compete with Australia on these foods. Only a small walk to the beach too, which is very nice with a gently sloping shore and a safe but fun swell for body surfing. You did have to cross a busy road to get to the beach however, so you need to be careful. Of course, Australia has the best beaches in the world, but this Thai beach was very nice. The hotel is quietly located yet well equipped with facilities. Really good place for family with children. Staff is excellent. Guest experience manager Alice will make sure that your stay is good and well taken care of. Reservations manager Sandra will make sure that the room meet your expectations. Overall giving you a pleasant and good experience staying with them. Great! Love all the activities for the kids. It’s a nice hotel but a little bit jaded around the edges. Very minor details, for example, a shower that was slightly faulty, stains on the walls in the bathroom. Minor details as I say but if you’re a 5 Star hotel, you should be immaculate. One word will do - Perfect! Great children friendly resort with lovely Thai staff. Kids kept busy. Room configurations make it easy for family groups. Grounds and pool fabulous with lots of activities like foam party, inflatable ball, aqua gym to keep kids busy. Also extra activities you can pay for at kids’ club. Probably best for kids 12 and under as teens may be a bit bored Massage at Spa was wonderful. Extensive range of food at morning buffet. Aircon in our room was a little noisy. Beds clean, a bit too firm for husband but my parents had no complaints. Not beach front but a buggy can take you to main road so you can cross it to Kamala beach. Lots of building at the moment along street, but should be nice once neighbouring hotel completed. Some confusion and mixed messages between different staff members as to whether the free dinner voucher could be used on buffet night. But we found the Thai staff generally more sweet and accommodating than the odd Russian ones. Some staff may not be fluent in English, but there is always other staff about to support them. Plus, no matter what, they try to help. Overall a lovely, pleasant spacious resort which kids adored and we enjoyed very much. Very happy with our stay. Always clean room and outside areas, great staff and good breakfast. I thoroughly enjoy going back to Swissotel. Staff are very friendly, we have seen many new activities for families. Pool is great. Great stay, breakfast was amazing with plenty of choice. Friendly staff, great activities for kids. English was sometimes a bit of a problem and we found that sometimes we weren't understood by the restaurant staff. Hotel room was clean and bed was so comfy. Especially liked the travel buddy phone in the room, which had internet so you could check maps etc. outside the hotel, it came in really handy! Hotel appeared a great place for young families.